Until now I have only tried honey chicken at the local Chinese buffets here in Michigan. Most of the honey chicken at the buffets I find a little too sweet for my liking. I decided I wanted to give it a try at home and came across a recipe that looked pretty good, and indeed it was. Basically this is no different than any other Chinese chicken recipe. The chicken is first battered, deep fried and then coated with a thick sauce. You can use a wok but I really recommend deep frying the chicken bits when using a batter like this. The sauce is a delicious mixture of honey, garlic, and ginger and rice vinegar. Serve with white rice. Enjoy. In a large bowl mix all batter ingredients together until smooth. Cover and allow the batter to sit for at least 30 minutes. Add the chicken to the batter tossing to coat. Heat a deep fryer to 350 degrees. Fry chicken bits in patches for 2 minutes or until batter becomes firm. Drain on paper towels. To make the sauce. Heat 1 ½ tablespoons of oil in your work. Add garlic and ginger and stir fry for 30 seconds. Add salt, honey, vinegar, and water. Mix well. Combine 1 teaspoon of water with 1 teaspoon of cornstarch. Add to the sauce and Simmer for 2 minutes. Coat chicken with the sauce and garnish with sesame seeds. Serve with white rice. Do you have to let the batter sit for at least 30 minutes before adding in the chicken? Ling- I wouldn’t say you have to let it sit. It should be okay if you dont. Man, I love honey chicken. I’ve never made it before, and I was so excited when I found this that I made it the same night. I had to substitute the honey with golden syrup (have not been able to eat honey now for 4 yrs thanks to fructose malabsorption) and it is very tasty. A different type of sweetness (thanks to the glucose) but still amazing. Will definitely be made again, thanks! i cooked this dish for a school assessment! This looks delicious!!! I am going to try to make this for dinner tonight, but with less garlic and honey. Thanks Bobby! 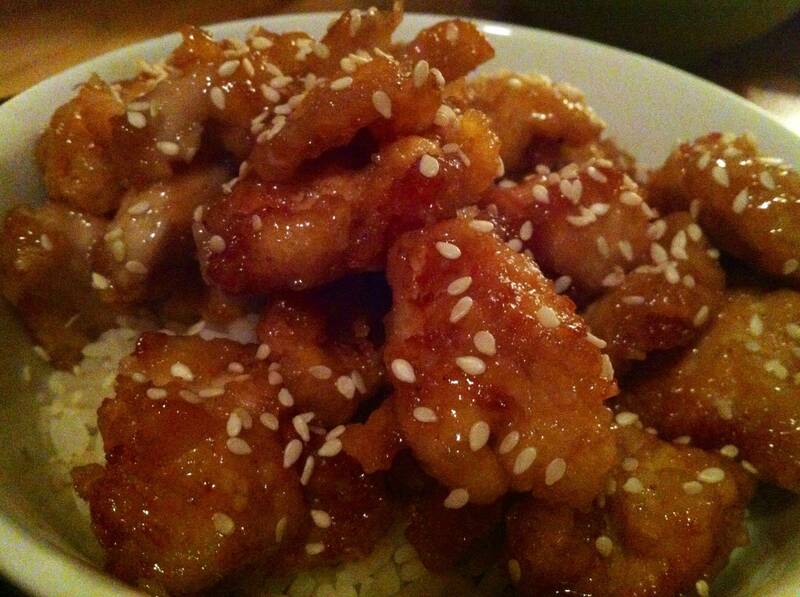 i personally suggest all should try this honey chicken…. i love this recipe! the batter made the chicken so light and crispy and the sauce was delicious! What if you have ground ginger instead of minced will it still work? Bekah- Yes, you could use ground ginger but you will probably want to use less. Although I added more honey and less garlic. And then batter could have been a little thicker, but that is the only cons, everything else was delicious! The flavors were good, but I couldn’t get the chicken brown enough or crispy enough. Maybe because the batter was too thin? I don’t know. This was really tasty. My 13 year old loved it. I doubled the sauce, but you don’t need to. It was a little time consuming, for me.. so I don’t know how often it will be made. But, it was good. The batter was delicious..sauce too gingery for my liking but will definately be using batter recipe again. Came across this yesterday & we are trying it tonight! It looks delicious! simple to make, fast to cook,great to taste. Made this for dinner tonight. I grilled strips of chicken breast and then chopped it up in 2 inch pieces, coated in sauce and sesame seeds…ooh man it was fantastic. I know fried chicken pieces would be even better! Thanks for the great recipe will definitely make this again! Made this tonight and it was absolutely delicious! The only things I did differently was doubled the sauce, added extra honey and instead of this batter, I used the one from the General Tso’s recipe because it was easier to make. Came out wonderful! Hi! This sounds delicious!!! I just got an actifry for christmas!Could I cook this recipe in that and if so, what would the directions be? Luisa – Sorry, I cannot give you any advice because I am not familiar with actifry. I made this recipe over the weekend and it turned out awesome! Nicely done! The sauce is sweet but delicious, you could easily use this for any meat. Just made this today – LOVED IT! Thank you! Amazing! I made these for dinner and my family loved them! Thank you! Tried it tonight and the family was pretty impressed. Loved it! Although for thicker batter i rolled my chicken in flour (to which i added a generous pinch of salt) before i covered it with the egg batter. Thanks you so much for sharing! Made this tonight and invited the neighbor over. It was a hit! Only change I made was to add carrots andgreen beans stirfried in the same sauce as the chicken. I didnt think there was enough of the sauce when I got done so I made more. De-LISH! Very disappointing recipe. I cut the garlic to 1 TBS and ALL I could taste was garlic, it needs way more honey. The salt needs to be cut in half in both the sauce and the batter. The batter itself has the right consistency to make crispy chicken, but didn’t stick to the chicken. Half the batter slipped off the chicken right when I started frying, and the rest slid off during turning and when I pulled them out, and on top of that even after turning a golden brown was soggy and inedible. Wasted a lot of time prepping and cleaning up for something I threw in the trash. I made this for dinner this evening. After reading all the reviews, I modified it as follows: added 1/4 more flour to the batter and used 2 whole eggs. Added 2 inches of oil to small pot and fried the battered chicken in batches. The batter stayed on the chicken and turned a much nicer brown color. I used sesame oil for the sauce, cut the garlic in half and doubled the honey. I also doubled the sauce recipe. I served it over saffron rice. i tried this recipe, and sorry to say mate, it was rubbish, so i altered it the next time. if anyone likes the sweet restaurant style honey chicken, take out most of the ginger and garlic from the sauce. plus ADD around 3 teaspoons of white sugar. to me these amendments made it virtually restaurant quality honey chicken. plz tell me can we replace cornflour to corn starch? Nasreen Khan – Yes, cornflour will work fine. You should be able to find it at a grocery store, probably in the Asian section. Super Wal-Marts will carry it as well. is it possible to fry chicken in just 2 min….. It could be possible if the pieces are small enough. Make sure the internal temperature of the chicken reaches 165 degrees F.
Will be trying this tonight, have bought the packet batter and says to flour chicken first, and think I will go easy on the garlic and ginger as the little ones may not take to it, will let you know how I go! I hope it turns out! Does any one know the nutritional values of this garlic honey chicken recipe, maybe per once of the finished dish?